I just happened to be passing. Early evening. For once I resist the pizzas. Magic Rock - Dark Arts 6.00 Black. A particularly fine Stout. Rich and roasted with dark fruits. Five Points - Railway Porter 4.80 I love this beer. Early evening before the crowds. Five Points - Pale 4.40 On splendid form. Duration - Ebb & Flow 6.00 Keg dispense. Quite a hoppy, dry Porter. This is becoming a regular beer and pizza stop for me. Five Points - Railway Porter 4.80 Reliably excellent. Five Points - Railway Porter 4.80 As good as always. Early evening for beer and pizza. Kirkstall - Kirkstall Pale Ale 4.00 A very decent Pale. Dry. Quite grassy. Five Points - Railway Porter 4.80 Always lovely in here. As soon as I walk in the barmaid tells me how excited she is because it's going to snow and she has never seen snow in her life. Nonsense say I, it's far too mild. Within minutes there are blizzard conditions outside and she is beside herself with excitement. Five Points - English IPA 5.70 Amber. Well-hopped with English varieties. A touch of sweetness. Five Points - Railway Porter 4.80 In splendid form. Five Points - Brick Field Brown 5.40 Another winner from Five Points. East London (ELB) - Three Kings 3.80 A fruity, light Bitter. Jester hops prominent. Well, I've only gone and told them at work where they can stick their poxy job. Admittedly, this leaves me at something of a loose end today and I am in here way too early in the day. I even have to wait for chef to fire up the furnaces before I can order a pizza. Five Points - Derailed Porter 5.20 Excellent, souped-up version of the Railway Porter. Gipsy Hill - Koshu Brut 4.80 From a keg. Pale gold, dry, lemony and effervescent. 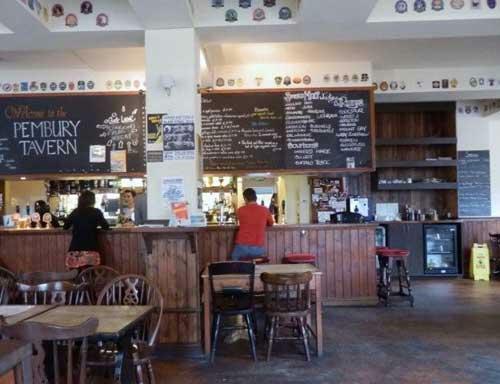 This pub is much-revived following change of ownership and refurbishment. Milton - Nero 5.00 A smooth and creamy Stout with fruit and liquorice. 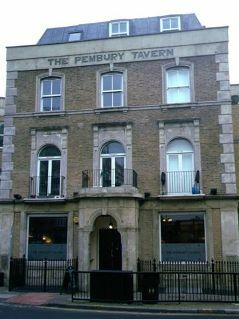 The pub is found in Hackney, Greater London, E8 1JH. This pub was built in around 1866 and for many years was a Truman’s house. By the 1970s it was best known as a live music venue, with a large hall to the rear (which has now been converted to residential use). The pub was refurbished in 1983 and by 1986 had been acquired by Banks & Taylor Brewery. Closed for five and a half years from 1998, it re-opened but led a precipitous existence until acquired by Milton Brewery in 2006. In May 2018 the keys passed to the nearby Five Points Brewery. It is a large, stone and brick building on a busy junction near Hackney Downs and Central railway stations. The long wooden bar has 6 handpumps (down from 16 in Milton’s time). There is a bar billiards table, a pizza kitchen and a small outside seating area beside the road junction. We have visited this pub 49 times, seen 188 different beers and tried 124 of them.